The First Endurance website has an article entitled “Reviewing research aspects of the ketogenic diet on endurance athlete performance: should I try it out?” Loulika Lili-Williams, PhD, which accurately defines the KD as a high-fat, low carbohydrate and protein sufficient diet. This article does a great job of describing how the KD has traditionally been used by dietitians and doctors in clinical settings to treat neurological disorders and errors in metabolism (i.e., diabetes). The method lends itself to the research that eating more fat than carbohydrates stimulates the body to oxidize fatty acids and use ketone bodies for energy. Thus, putting the body in a state of ketosis. As Dr. Lili-Williams summarizes from current research studies, the metabolic benefits to endurance athletes can include increased ATP and mitochondria production, efficient fatty acid oxidation, and maybe VO2 max increase. These are all desirable adaptations, but there are also studies that show the KD methods leading to dehydration and hypoglycemia, and decreased ability to maintain anaerobic workload. Go to firstendurance.com for more information on the specifics of the diet and the current science behind the ketogenic diet and affects on athletes. To cover the basics of the macronutrient, fat provides energy during low to moderate intensity exercise (i.e., walking, jogging, easy cycling). At an endurance pace, we burn about 50% carbohydrates and 50% fats. The higher the intensity, the more carbohydrates we use. Until we are anaerobic, which is when lactic acid is generated, and only lasts ~15 seconds, then it’s back to carbs and fats for fuel (see figure below). Carbohydrates (CHO) are the body’s primary energy source during exercise. Dietary CHO (grains, fruit, starchy veggies, juice and sport drinks) are stored in the liver and in the muscle as glycogen. limited, so during exercise lasting more than 60-90 minutes, consuming carbohydrate while exercising improves performance. More specifically, 30-60g of carb/hour will help keep you fueled and feeling strong. The standard recommendation for endurance athletes need 50-65% of total calories from carbohydrates. That means the ketogenic diet, which can be 65% or more of total caloric intake from fat, is a huge deviation from that. This is where it is important to look at the individual athlete to determine what the ratios of carbohydrate:protein should be, because everyBODY is different. 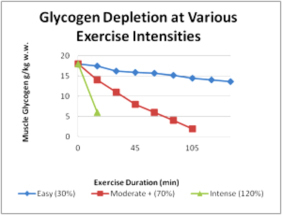 Not only do intensity and duration of workout determine macronutrient needs, but macronutrient percentages that work for some may be totally different for another depending on age, gender, fitness level, metabolic rate, training/racing calendar, and genetics. Based on the food science discussed so far, the question becomes whether or not the ketogenic diet is the best option for endurance athletes, especially because macronutrient needs can differ on a day-to day basis? It seems logical that sparing carbohydrates to promote fat burning could be ideal, and there is some validity to this, but we must look at each athlete as an individual. An athlete that does ultra-endurance activities, where they train and compete for long hours at low intensity would benefit more from a KD than an athlete that needs high end power for sprints and short duration intensity. As stated earlier in this discussion, long sustained efforts utilize more fatty acids for fuel, whereas short intense efforts rely almost solely on carbohydrates. A modified ketogenic diet , as presented in this paper, is an attempt to find the best method to appropriately fuel an endurance athlete, with the mindset that we put the proper gas in our fuel tank to make our body engines achieve optimal results. Endurance athletes would do well on a 50:35:15 percent CHO:fat:protein ratio, respectively. That would be the lowest one should go in carbohydrates and protein but still get the positive ketogenic effects of utilizing fats, sparing carbs, and running hat engine all day. Then, as the duration decreases and intensity of anaerobic efforts increases in training or racing changes, the KD could be adjusted to 55:30:15, 60:25:15, or 65:25:10 percents, respectively. This way, basing the diet plan on what the individual is doing will lend itself to optimal performance as well as long term health. When implementing the modified KD for YOUR specific needs and exercise output, be sure to choose LEAN meat and limit red meat consumption. When choosing dairy products, opt for skim or 1% because low to no fat is all you need. The nutrients are in the milk, not the fat. Milk alternatives (almond, soy, rice, etc.) are great substitutes with all the calcium and nutrition you need. Be sure to favor fresh, whole, UNPROCESSED foods. Reconsider getting “fast” food, as it is traditionally low quality, and high in saturated fat, especially prior to training or competition. Instead, favor carbohydrates with low to moderate amounts of healthy fats. Fat takes longer to digest than carbohydrates, so pre workout meals should be low in fat content so you are ready to roll. Also, recovery nutrition should be appropriate for the exercise performed, meaning mainly carbohydrates to replace glycogen to the muscles and moderate amounts of protein to repair tissues. Be sure to get the fats you need in the meals NOT immediately surrounding training or competition so they have time to get digested and the body can efficiently break them down to use as fuel. This is when the ketogenic diet will work as it is designated to.